Where am I? 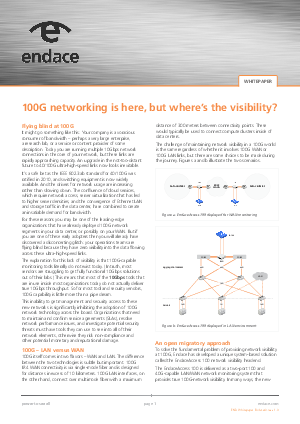 › Home > White Papers > Endace > 100G Networking Is Here, But Where’s the Visibility? Your company is a voracious consumer of bandwidth – perhaps a very large enterprise, a research lab, or a service or content provider of somedescription. Today you are running multiple 10Gbps network connections in the core of your network, but these links are rapidly approaching capacity. An upgrade in the not-too-distant future to 40/100G ultra-high-speed links now looks inevitable. Read on to solve the fundamental problem of providing network visibility at 100G.